The Graduation Paper is devoted to using the topical project work “My Body” for developing all language skills in junior classes. The aim of the research was to stimulate the interest in studying the language and to improve the skills and knowledge of pupils with the help of the topical project work “My Body”. To achieve the aim the author studied methodological literature on using project works for developing different skills. Then the project work was practically implemented in junior classes. Finally, the results of the case study were analyzed. A case study was applied as a research method to investigate the sample consisting of 23 students at Jēkabpils Secondary School № 2 aged 10-12 in grade 4. The research revealed the importance and usefulness of using the topical project work “My Body” at the English lessons. It also showed that the project work is an effective method of developing all language skills of young learners. With the help of the research the author realised that more students had arisen their interest in learning English and improved their practical skills in communication through English. This study proves also that the project work elevates the effectiveness of learning English. During the project work atmosphere in the class was very positive, friendly. The learners’ attitude to doing all types of tasks was positive and involved children to the learning process. It can be concluded that much has been achieved on the way towards studying the project’s method, but the work on this issue should be continued. The materials applied can be used in grades 5 –6. Kvalifikācijas darbā tiek piedāvāta 4.d klases skolēnu iepazīšanās ar projektu “My Body” angļu valodas stundās. Darba tēma: Lasīšanas, rakstīšanas, klausīšanās un runāšanas iemaņu attīstība, izmantojot projektu nedēļas tēmu “My Body” 4.klasē. Zinātniskā vadītāja: angļu valodas skolotāja Nataļja Dogureviča. Darba struktūra: ievads, teorētiskā daļa, eksperimentālā daļa, secinājumi, literatūras saraksts, pielikumi. Pētījuma mērķis: apzināties projektu metodes īstenošanas principus, to ietekmi uz iemaņu attīstību angļu valodas stundās. Pedagoģiskās un psiholoģiskās literatūras iepazīšana un analīze. Izstrādāt un aprobēt projekta tēmu “My Body” 4.d klasē. Apkopot un analizēt iegūtos datus. Pētījuma hipotēze: skolēnu iemaņu attīstība norisinās veiksmīgāk, ja skolotājs savā darbā izmanto projekta tēmu “My Body” atbilstoši bērnu interesēm un vecumposmiem. Projekti kā metode attīsta un pilnveido skolēnu prasmes. Projekta darbu angļu valodas stundās ievieš, lai stundas kļūtu interesantākas, daudzveidīgākas un ciešāk saistītas ar reālo dzīvi, ar skolēnu aktuālām problēmām. First of al it is possible to say that the children are given basic knowledge in the elementary school. Listening, reading, writing and speaking in a foreign language is a difficult art and it has to be learned starting in junior classes. The theme of Graduation Paper is Use of the Topical Project Work “My Body” for Developing all Language Skills in Form 4. The aim of paper is to stimulate the interest in studying the English language and to improve the skills and knowledge of pupils with the help of project work “My Body”. The hypothesis of the paper is that the effective use of the project work successfully develops all language skills of young learners. 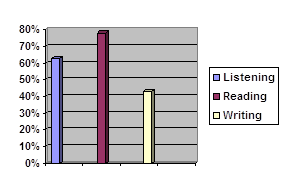 Figure 1 shows the result of the questionnaire. So, refer to the Gardner’s table of the intelligences it is possible to conclude that the most part of the learners had linguistic, visual and socialiser intelligences. The next teacher’s step was to complete a set of activities and tasks for the theme “My Body” according to the students types of intelligence. Having studied the advantages and disadvantages of the project work and work in big classes it was decided to organise the class into pairs and groups. Table 2 reflects the summary of the activities used for developing four language skills. This material was designed for young children. Project work was begun with the song ”Head and Shoulders”. Children sang and touched the body parts mentioned in the song. The game “Parts of the Body’. Education is very important in our life. An educated person is one who knows a lot about many things. He always tries to learn, find out, discover more about the world around him. He gets knowledge from books, magazines, TV educational programs. The pupils can get deeper knowledge in different optional courses in different subjects and school offers these opportunities. The result of the educative process is the capacity of further education. Nowadays students of secondary school have opportunities to continue their education by entering gymnasiums, lyceums, colleges, universities. Children are given basic knowledge in the elementary school. But the road to learn is not easy. There is no royal road to learning. To be successful in studies one must work hard. The role of foreign languages is also increasing today. To know foreign languages is absolutely necessary for every educated person, for being a good specialist. English is widely spoken in the world. It is the language of progressive science and technology, trade and cultural relations, commerce and business. It is also the major language of diplomacy. Listening, reading, speaking and writing in a foreign language is a difficult art and it has to be learned starting in junior classes. The aim of the paper is to stimulate the interest in studying the language and to improve the skills and knowledge of pupils with the help of project work “My Body”. 3. to analyze the results of the topical project work in form 4.
observation and evaluation of project lessons. Chapter 1 views the aspects of intellectual development of young learners. Chapter 2 describes importance of using pair work and group work at project lessons. Chapter 3 shows how to use project work for developing all language skills. Chapter 4 analyses the results of the questionnaire and implementation of the project work “My Body” in form 4. Changes in mental abilities – such as learning, memory, reasoning, thinking, and language – are aspects of intellectual development. The concrete operational period is the period of middle childhood. It extends from about age 6 to about age 11 or 12. Today, the large majority of child psychologists identify themselves with one of three general theoretical views – the cognitive-developmental approach, the environmental/learning approach, or the ethnological approach. The cognitive-developmental approach encompasses a number of related theories and kinds of research. This approach is most closely associated with the work of Piaget (1952). Sometime between 5 and 7 years of age, according to Piaget, children enter the stage of concrete operations, when they can think logically about the here and now. They generally remain in this sage until about age 11. But development at these ages is still highly significant. Intellectual growth is substantial, as the once ago centric, child becomes more logical. And the accumulation of day-by-day changes results in a starting difference between 6-year-olds and 12-year-olds. According to Piaget’s theory, human development can be described in terms of functions and structures. The most fundamental aspect of Piaget’s theory, and often the most difficult to comprehend, is his belief that intelligence is not something that a child has but something that a child does. Piaget’s child understands the world only by acting on it, making intelligence a process rather than a static store of information. For Piaget development refers to this continual reorganization of the child’s knowledge into new and more complex structures. Piaget was a stage theorist. In his view, all children move through the same stages of cognitive development in the same order. The most influential contemporary theory of the effects of social experience on cognitive development is that of Soviet psychologist Lev Vygotsky ( 1962). Vygotsky’s theory includes a number of related emphases. Perhaps the most general emphasis is on the culture as a determinant of individual development. Humans are the only species that have created cultures, and every human child in the context of a culture. The culture makes two sorts of contributions to the child’s intellectual development. First, children acquire much of the content of their thinking from it. Second, children acquire much of the means of their thinking – or what Vygotskians call the tools of intellectual adaptation – from it. In short, the surrounding culture teaches children both what to think and how to think. Environmental/learning theories begin with the assumption that much of children’s typical behaviour is acquired through conditioning and learning principles. Learning theory, in contrast, holds that children’s toy preferences do not necessarily grow out of what they know about their gender but often result from what has happened when they played with certain toys. B. F. Skinner (1953) accepted the role of Pavlov’s conditioning of reflexes, but he added to learning theory a second type of behaviour and, correspondingly, a second type of learning. According to his model, all behaviour falls into one of two categories – respondent behaviours and operant behaviours. Behaviour analyses also views human development as passing through stages, termed the foundational stage (infancy) the bases stage (childhood and adolescence), and the societal stage (adulthood and old age). The environment puts constraints on behaviour; it limits what we can do. The environment elicits behaviour; it tells us how to act. The environment moulds the self. To conclude, language is developed quickly in middle childhood, children can understand and interpret communications better, and they are better able to make themselves understood. Cognitive/development theory contends that children first develop an understanding that they are male or female consistently with their gender, as when a girl comes to prefer playing with dolls to playing with trucks. The cognitive-development approach to human development is based on the belief that cognitive abilities are fundamental and that they guide children’s behaviour. The most influential current theory of how social experience affects cognitive development is that of Vygotsky. Vygotsky’s theory stresses the child’s gradual internalization of culturally provided forms of knowledge and tools of adaptation, primarily through verbal interchanges with parents. Teachers can hardly work at the child’s level unless they know what that level is. It is important to match topics to the level, reserving complex issues for more advanced classes. Teachers should not expect beginners to tackle a national newspaper in English; they would not offer very advanced students a simplified dialogue. The traditional lessons do not give a chance for cognitive and creative development. Teachers of beginners will necessary use activities whose organisation is less complex then those for more advanced learners. Teachers find it quite effective to develop all language skills for beginner students. Longman Dictionary of English Language and Culture defines the word project as a piece of work that needs skill, effort and careful planning, especially, over a period of time (8, 1378). a concern for the general educational development of the learner (18, 26). Project learning has not been redacted on the teaching methods, it is more educational philosophy, which aims are to show the way and to introduce with some possible activities achieving to a more democratic society, points Legutke (9,1982). The child is naturally active, especially along social lines. Teachers just should choose the appropriate teaching method. We think that project method is one of the most effective teaching forms. The originators of a project work have arrived at decisions about types of activities, role of teachers and learners, the kinds of the material which will be helpful, and some model of syllabus organisation. Project can consist of intensive activities which take place over a short period of time, or extended studies which may take up one or two hours a week for several weeks (7, 7). Project work gives the students an opportunity to bring their knowledge, feelings, experience, ideas and intelligence of their world into the school and out of it – to the area where the project work take place. Projects can include a wide range of the topics and use knowledge and experience gained from the other subjects in the curriculum. In big classes, it is difficult for the teacher to make contact with the students at the back and it is difficult for the students to ask for and receive individual attention. It may seem impossible to organise dynamic and creative teaching and learning sessions. In large classes, pair-work and group-work play an important part since they maximise student participation. When teachers know how their students feel about pair-work and group-work it is easier to decide what method should be applied and what kind of the activities to perform. 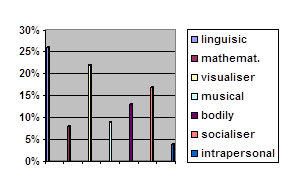 All people have all of these intelligences, he said, but in each person one (or more) of them is more pronounced. If teachers accept that different intelligences predominate in different people, it suggests that the same learning task may not be appropriate for all of students. Organizing pupils into pairs is an important job for the teacher at the project lesson. In pair work students can practise the language together, study a text, research the language or take part in information-gap activities. They can write dialogues, predict the content of reading texts, or compare on what they have listened to or seen. The most important advantages and disadvantages of using pair work at project lessons saw S. Haines (1995). It dramatically increases the amount of speaking time any one student gets in the class. It allows students to work and interact independently without the necessary guidance of the teacher, thus promoting learner independence. It allows teachers time to work with one or two pairs while the other students continue working. It recognises the old maxim that ‘two heads are better than one’, and in promoting cooperation helps the classroom to become a more relaxed and friendly place. If teachers get students to make decisions in pairs, they will be allowed to share responsibility rather than having to bear the whole weight themselves. It is relatively quick and easy to organise. Pair-work is frequently very noisy and some teachers and students dislike this. Teachers in particular worry that they will lose control of their class. Students in pairs can often veer away from the point of an exercise, talking about something else completely, often in their first language. It is also possible to put students in large groups too, since this will allow them to do a range of tasks for which pair-work is not sufficient or appropriate. Thus, students can write a group story or role-play a situation which involves five or six people. They can prepare a presentation or discuss an issue and come to a group decision. Students can watch, write or perform a video sequence; teachers can give individual students in a group different lines of a poem which the group has to reassemble. In general it is possible to say that small groups of around five students provoke greater involvement and participation than large groups. They are small enough for real interpersonal interaction, yet not so small that members are over-reliant upon each individual. Because five is an odd number, it means that a majority view can usually prevail. However, there are occasions when large groups are necessary. The activity may demand it, or we may want to divide the class into teams for some game or preparation phase. Unlike pair-work, because there are more than two people in the group, personal relationships are usually less problematic; there is also a greater chance of different opinions and varied contribution than pair-work, and yet is more private than work in front of the whole class. It promotes learner autonomy by allowing students to make their own decisions in the group without being told what to do by the teacher. Like pair work, it dramatically increases the amount for individual students. It is likely to be noisy. Some teachers feel that they lose control, and the whole-class feeling which has been painstakingly built up may dissipate when the class is split into smaller entities. Groups can take longer to organise than pairs. In conclusion it should be mentioned that project work is topic-based which involves research/questionnaires project encourage cooperation and sharing, it may be very creative artwork. While project work it is possible to use such forms of class organization as pair and group work. It helps for developing all language skills at the project lessons. Generally teaching aims in foreign languages methodologists tend to divide into some parts – structures, functions, vocabulary, pronunciation and skills. they should learn to speak it. Most modern school curricula require all subjects to encourage initiative, independence, self-discipline, imagination, development of all language skills, so the project work is a way of turning such general aims into practical classroom activity and involve children into teaching process (6, 119). Project provides a natural context in which these separate parts can be re-integrated in learners’ minds. This is important for students to be sure about their own abilities to use target language in real situations. It is student’s own interests to produce language that is accurate and fluent. Teachers and students encourage that projects break the routine. Project work demands creature and a lot of enthusiasm for both- teachers and learners. learners are involved with the ideas through a process of discussion, experimentation, reflection, and application of insights to the new stages of experimentation. For planning the structure of project work students and teacher make sure about every pupil’s responsibilities. During the project students practise in main language skills – listening, speaking, reading and writing. Reading and listening are receptive skills. Reading is not a passive skill. It is an incredibly active occupation. To do it successfully, we have to understand what the words mean, see the picture, the words are painting, understand the arguments and work out of we agree with them. When we read a text in our own language, we frequently have a good idea of the content before we actually read. Book covers give us a hint of what is in the book, photographs and headline hint at what articles are about and reports look like reports before we read a single word. Teachers should give students “hints” so that they can predict what is coming too. It will make them better and more engaged readers. There are many reasons why getting students to read English texts which is an important part of the teacher’s job. In the first place, many of them want to be able to read texts in English either for their careers, for study purposes or simply for pleasure. A balance has to be struck between real English on one hand and the students’ capabilities and interest on the other. There is some authentic written material which beginner students can understand to some degree: menus, timetables, sings and basic instructions, for example, and, where appropriate, can be used in project work. But for longer prose, teachers may want to offer their students texts which, while being like English, are nevertheless written or adapted especially for their level. The important thing is that such texts are as much like real English as possible (6, 86). Listening is a skill and any help students can be offered, in performing that skill will help them be better listeners. Listening to tapes is a way of bringing different kinds of speaking into the classroom, it is possible to play different kinds of tape to them, e.g. conversation, “plays”, interviews, stories read aloud, telephone exchanges etc. One of the main reasons for getting students to listen to spoken English is to let them hear different varieties and accents – rather than just the voice of their teacher with its own idiosyncrasies. In today’s world, they need to be exposed not only to one variety of English (British English, for example) but also to varieties such as American English, Australian English, Indian English or West African English. (6,124). The debate about use of authentic listening material is just as fierce in listening as it is in reading. If, for example, teachers play a tape of a political speech to complete beginners, they will not understand a word. If, on the other hand, students are given a realistic (though not authentic) tape of a telephone conversation, they may learn to gain confidence as a result. Everything depends on level, and the kind of tasks that go with a tape. There may be some authentic material which is usable by beginners such as pre-recorded announcements, telephone messages, etc. There are numbers of ways in which listening activities differ from otter classroom exercises: firstly, tapes go at the same special for everybody. Listening is special, too, because spoken language, especially when it is informal, has a number of unique features including the use of incomplete utterances, repetitions, hesitation, etc., experience of informal spoken English together with an appreciation of other spoken factors – the tone of the voice, the intonation the speakers use, rhythm, and background noise – will help students tease meaning out of such speech phenomena. Speaking and writing are the productive skills. Production processes control how well the child can reproduce the model’s responses. 1. Rehearsal: getting students to have a free discussion gives them a chance to rehearse having discussion in project work. 2. Feedback: speaking tasks where students are trying to use all and any language they know provides feedback for both teacher and students. Teacher can see how well their class is doing and what language problems they are having (that is a good reason for project lessons); students can also see how easy they find a particular kind of speaking and what they need to improve. One popular information-gap activity is called “Describe and Draw”. It has many of the elements of an ideal speaking activity. One way of provoking conversation and opinion exchange is to get students to conduct questionnaires and surveys. If the students plan these questionnaires themselves, the activity becomes even more useful. Role-play activities are those where students are asked to imagine that they are in different situations and act accordingly. Teachers can organise discussion sessions in their classroom, too. Writing is a basic language skill, just as important as speaking, listening, and reading. Students need to know how to write letters, how to put written reports together, how to reply to advertisement – and increasingly, how to write using electronic media. Part of teacher’s job is to give students that skill. Another factor which can determine teacher’s choice of writing task is the students’ interests. Teacher’s decisions, though, will be based on how much language the students know, what their interests are, and what teacher thinks will not only be useful for them but also motivate them as well. To sum up it is possible to say that while project work all language skills should be trained. So, speaking activities may well form one part of a much longer sequence which includes reading or listening and, after the activity, study work. The teaching of reading is intimately bound up with the teaching of writing: the one provides the model for the other. Writing is a basic language skill, just as important as speaking, listening and reading. Listening is a skill and any help teachers can give students in performing that skill will help them to be better listeners. The aim of the practical application of the project work “My Body” was to investigate the possibility to increase the student’s interest in learning the English language, to develop all language skills and improve knowledge of young learners. analysis of the results obtained. The practical application of the material was carried out from 1st October 2003 till 17th October 2003. It was realized in Jēkabpils Secondary School No2 with 4-th formers, three hours of the English language a week. The group consisted of 23 students. 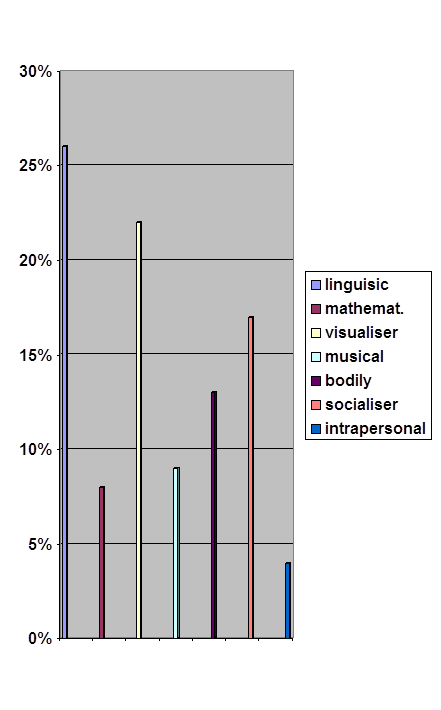 Figure 1 shows the result of the questionnaire where the vertical axis reflects the percentage of the students’ intelligences in 4-d class. It turned out that the most part of the learners had linguistic, visual and socialiser intelligences. So, refering to the Gardner’s table of intelligences (see Chapter 2) it is possible to conclude that 6 learners like to read, write and tell stories; 2 learners like to do experiments, ask questions; 5 learners like to draw, look at pictures; 2 learners like to sing, listen to music; 3 learners are good at physical activities; 4 learners like to join groups; 1 learner is the best by having own space. So, 14 respondents out of 23 confessed that they were afraid to speak in English and 10 respondents out of 23 understood very little while reading in English. Having generalized the results of the questionnaire and interviews with the students the following conclusion can be drawn. The teacher can use project work for developing all language skills. So, the next step to make was to complete a set of activities and tasks for the theme “My Body” according to the students’ types of intelligence. In order to develop all language skills according to the students’ types of intelligence, to motivate students to learn the language a set of activities and tasks was worked out. Having studied the advantages and disadvantages of the project work and work in big classes it was decided to organise the class into groups and pairs. The cognitive aim of the topic “My Body” was to review the knowledge about the body in English and through activities gain understanding of new information. Pupils were also expected to substantially develop their co-operative skills while working in pairs and in groups. The first project task was begun with the song “Head and Shoulders”. (Appendix 3) Children sang and touched the body parts mentioned in the song. Further, the teacher asked the children to listen to the dialogue and try to understand what the children were talking about. They also were supposed to discuss the dialogue, explain the phrases and words pupils did not understand. Work in groups: the teacher used Worksheet 1 (Appendix 5) for each group to fill in, introduced new words: weight, height, length, width. The teacher together with the nurse weighed the pupils and measured their height pupils in the medical room of the school. When Worksheet 1 was completed in groups, the pupils could repeat their results to their classmates at the second project lesson. When all these numerous tasks and activities were successfully performed, the author of the case study summarised the results of the students’ opinion about them. Table 3 shows that 20 students out of 23 liked the activities, 3 students out of 23 partly liked the activities at the project lessons. It proves that activities at the project lessons were used successfully. In those tasks the students had to demonstrate their knowledge of the new vocabulary which were used in the topic “My Body”. Figure 2 shows the results of the test, where the vertical axis reflects the percentage of development of the students’ skills. According to the final test 15 students out of 23 are good listeners, 18 students out of 23 are good readers, 10 students out of 23 are good writers. To compare the results of the first questionnaire with the final test the following conclusion can be drawn out that significant progress in training all language skills has been made. The results of the project work “My Body” showed that the pupils self-activity and potencial self-realization were grown. Needless to say that the English language has become very popular today. About 350 million people speak English as its first language. It is an official language in 44 countries. It is the dominant language of the medicine, electronics and space technology. A foreign language is not just a subject learnt in the classrooms. It is something which is used in real life situations. Project work is one of the teaching methods teachers can use for teaching the English language during learning process. The aim of the Paper was to stimulate the interest in studyng the English language and to improve the skills and knowledge of pupils with the help of project work “My Body”. the results of the case study have been analyzed. The research that was carried out based on the analysis of the theoretical literature and completed tasks and activities for the project work “My Body”, allowed the author to ascertain that the hypothesis of the Paper has been proved, that the effective use of the project work successfully develops all language skills of young learners. The study proved also that the project work elevated the effectiveness of learning English. Project work includes a lot of practical activities through which learners develop all skills and knowledge even in different school subjects. Project work is an example of the co-operative learning. In big classes it is possible to organise dynamic and creative teaching with the help of such teaching/learning organization forms as pair and group work. 1. Cooper, J.O., & Edge, D. Parenty “Strategies and Educational Methods” Columbus, Ohio: Charles E. Merrill, - 1981,- 250 p.
2. Edge, Julian. “Cooperative Development”. Longman, - 1992,- 106 p.
4. Feldman, G.G. “Speech and Language Service” Reston,VA: 1997, - 376 p.
5. Jill Hadfield “Elementary Vocabulary Games”. Longman, - 1998. 7. Haines, Simon.” Projects for the EFL Classroom”. Edinburgh: Nelson, 1989, -108 p.
8. Hutchinson, Tom, Project English 2, Teachers Book. Oxford, University Press,, 1986, - 120 p.
9. Longman Dictionary of English Language and Culture. Longman Group UK Limited, -1982, GB, -1528 p.
10.Legutke, Michael & Thomas, Howard. Process and Experience in the Language Classroom. London & New York: Longman Group UK Limited, -1991, -331 p.
11. Piaget J. (1952) “The Origins of Intelligence in children” New-York. 12. Skinner B. F. (1953) “Science and human behaviour” New-York. 13. Stephens, T.M. “ Teaching skills to children with learning and behaviour disorders” Columbus, Ohio: Charles E. Merrill, -1977, -640 p.
14. Ross Vasta “Child Psychology the Modern Science”. J. Wiley& sons,. INC. –1992, - 665p. 15. J. V. Thill, Coutland L. Bover. “Excellent in Business Communication” United States – Case Studies, -1991, -600 p.
17. Diana E. Papalia. “Human Development”. Mc Graw-Hill, INC- 1992 - 230 p.
18. Underwood, Mary, Effective Class Management. London: Longman,- - 1987, -96 p.
19. J. Wills “Prevention of Child Maltreatment” A Wiley – Inter science Publication – 1992, - 436 p.
20. William L. “Exceptional Children”. Heward /Michael D. Columbus, Ohio: -1984, -265 p.
21. Wallace, G. “Teaching Children with Learning Problems”. Columbus, Ohio: -1984, - 473 p.
22. Project Work/Ideas for Communicative Language Teaching// An Introductory Booklet for Teachers of English, -2002, p.26-28. 24. http://www.cal.projbase.Project - Based Learning for Adult English Language Learners.